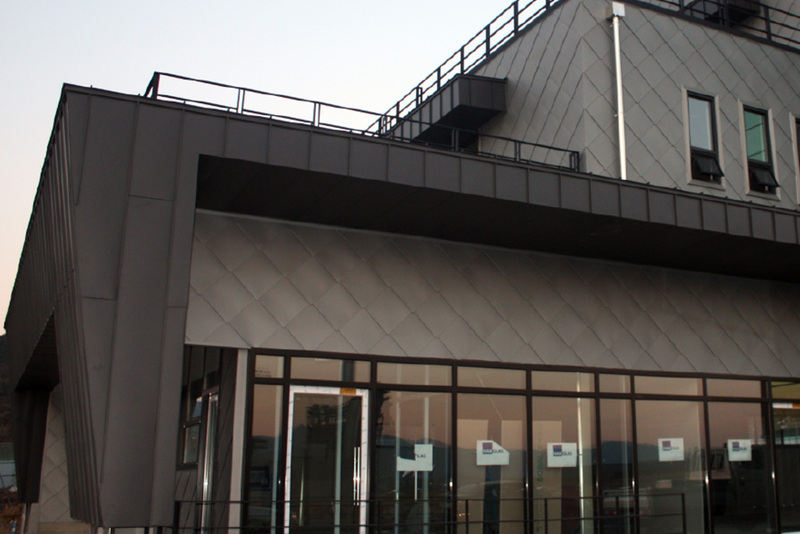 The system is suitable for flat and curved façades. Also known as the shingle system, it offers a convincing combination of delicate appearance, economy, and real ease of installation. It is a very durable, light-weight and very low maintenance construction. The shingles can be set at various orientations and in different geometric shapes, giving many design possibilities that allow the system to be equally well adapted to classical or contemporary architecture. The system is usually built in a vented façade construction, with all of the advantages that this brings for the building. The fixing is hidden and indirect. It needs a continuous support behind it and normally uses thicknesses of 0.7 and 0.8mm. Traditional cladding system using interlocking panels. Principally used in façade cladding, on flat or curved areas. Weather-tight from 25º of pitch and above if used in roofing. Attractive design layouts complement different architectural styles.